In this E.T.C. 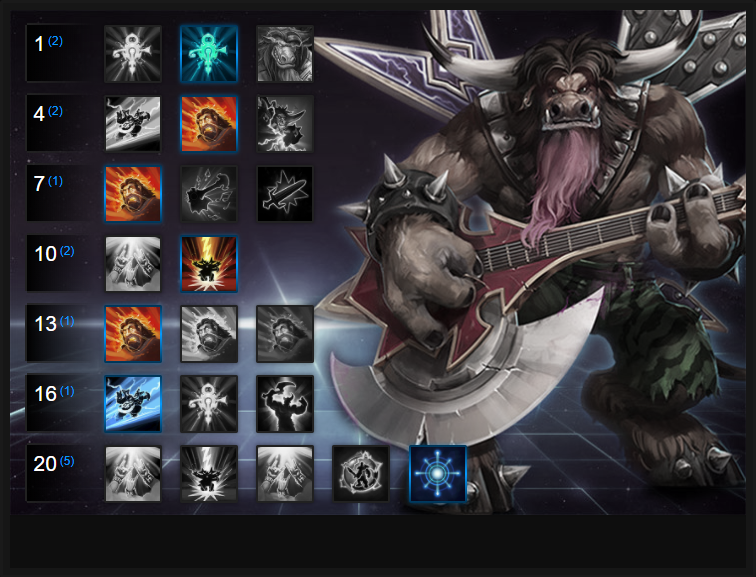 Build Guide, we provide an overview of his strengths, abilities and talents. E.T.C. is a very powerful Warrior that offers some of the best initiation in the game. With the ability to slide in and out of combat, boost his allies and provide himself with regeneration, there's little wonder he remains a top-tier choice. Considering he also has one of the strongest heroic abilities in the game (Mosh Pit) he's still regularly picked in competitive play. It's also worth noting that the two-tank Meta really suits E.T.C as it means he can pair with a damage heavy Warrior or one that has much more survivability (such as Muradin). The one drawback of E.T.C. is that if he's caught out of position he can die fairly easily, especially if his team don't back him up, but thanks to his Powerslide and Guitar Solo, he can be difficult to pin down when running away. Rockstar (Trait) – Rockstar allows E.T.C to boost his armor every time he uses a basic or heroic ability. It doesn't stack, but lasts 2 seconds and grants him a straight 20% damage reduction while it's active. Key to surviving with E.T.C right now is ensuring Rockstar is constantly active, whether hitting minions or players. Effective rotation of your abilities ensures that you can maintain the 20% armor bonus fairly frequently. Powerslide (Q) – This is your main source of initiation, as well as your most effective way of peeling for your teammates and interrupting channels. Powerslide can also be used to block the escape of fleeing enemies, or to quickly become a shield for your allies. It combos extremely well with Face Melt, but be sure not to always engage with it as you'll then be left with limited means of escaping for at least 12 seconds. Face Melt (W) – The damage of this ability is negligible by default, but the displacement it offers can be extremely valuable. As mentioned earlier, it combos well with Powerslide, as you can dash to your desired location, then either push enemies away, or isolate a priority target and send them alone right into the rest of your team. Face Melt also offers a reliable way to interrupt channeled abilities. Guitar Solo (E) – The health regeneration provided by Guitar Solo makes it very difficult for E.T.C. to be poked down, and will also make him a challenge to be taken down in a 1v1 situation, particularly as the game goes on. This means it will often take multiple enemy Heroes to try to stop E.T.C., and that can free up the rest of your team to take an objective, or force a favorable fight. By level 20 it heals for around 120 health per second for 4 seconds: not too bad when you consider its low cooldown. Mosh Pit (R) – Your best-case scenario is to being able to Powerslide into the middle of a grouped-up team, and land a 5-man stun with Mosh Pit. Of course, this won’t always be possible, and there will certainly be times where you’ll simply need to start Moshing with 2 or 3 priority targets. Be aware that crowd control will stop this ability as it is a channel, so you need to be conscious of who’s a threat to stop you on the enemy team. Most teams will draft plenty of stuns to deal with Mosh Pit so you may have to turn to Stage Dive. Stage Dive (R) – There is a short channel time to trigger Stage Dive but E.T.C. has global range on his jump. Due to the lengthy and hefty slow that Stage Dive applies, this can be a very effective initiation tool. If nothing else, it can force your foes to split up and/or burn their movement speed abilities, which can set up a favorable fight for your side. With Battlegrounds getting larger and requiring objective interaction, Stage Dive has taken up root as E.T.C's best Heroic simply for the global pressure it provides. Like our E.T.C build guide? You can help support its updates by subscribing to Ten Ton Hammer. Here's the details. Prog Rock is a Quest Talent for Guitar Solo which allows E.T.C to increase the healing he gains, up to a maximum of 100 additional healing. In addition, when completed, Prog Rock allows Guitar Solo to heal those around E.T.C. For pure sustain, it's fantastic. Increasing the knockback distance and range of Face Melt by 50%, Loud Speakers allows E.T.C to not only protect his team easier, but also push an enemy Hero much further away from their team once he has used Powerslide. Pinball Wizard allows your Face Melt to deal 200% bonus damage to anyone affected by Powerslide. Considering you'll regularly hit multiple foes, it's a huge boost to your damage that can cause real problems for lone targets, or groups. Variable: For a more minion orientated option, Echo Pedal is a great alternative as it allows E.T.C to cause a pulse every time he uses a basic or heroic ability. The damage bonus is 250% against minions and mercs, allowing him to clear waves and camps much quicker. Stage Dive is often the go-to Heroic for E.T.C right now. With large Battlegrounds and objective heavy maps, this global Heroic is a must. Its slow is amazing, the fact it can land you anywhere a life-saver and you can often bully lanes in an instant. When your opponents have lots of crowd control, it's your only option. Variable: It can be difficult to "land" properly in a PUG environment as your team, without communications, won't know when you're going to do it. That said, if you can land a Mosh Pit and your team is prepared for it (or sees you diving in) then you'll no doubt cause major problems for the opposing team. Mic Check allows E.T.C to lower the cooldown of his Face Melt by 6 seconds if he hits more than 2 targets. This halves its cooldown and is easily achieved, especially mid and late game. It provides lots more suvivability and makes E.T.C a huge nuisance. Show Stopper reduces all damage taken by E.T.C. by 15% for 4 seconds after using Powerslide. Your initiation just got uber and your survivability significantly better. It's a no-brainer, and pairs in well with Block Party. Purely for escaping, or initiating (and then still having Power Slide), Bolt of the Storm is fantastic for E.T.C. Variable: Death Metal is a fantastic alternative as it ensures when E.T.C does die, he uses a Mosh Pitt at his location. This, if he dies in the right spot, can often result in the enemy team being wiped (as long as you have other team mates alive). These Hero Threat Levels (1 being lowest threat and 10 being highest threat) are to help you determine which enemy Heroes can give you a headache. For the Heroes listed here, take extra care as they're particularly dangerous for E.T.C. Brightwing: Polymorph is a nuisance and can instantly prevent your Mosh Pit. Jaina: Her range, damage and slow destroy just about everyone. E.T.C. is no different. Falstad: His mobility and damage can be a real headache to deal with. Even if you do Powerslide towards him, he'll just dart away. Nazeebo: His Zombie Wall, leaping Corpse Spiders and both Ultimate abilities are a challenge as they'll deal lots of damage before you get anywhere near. The Butcher: Lamb to the Slaughter will gaurentee that you die and his Onslaught > Hamstring combo will eat a ton of your health. Thrall: His self healing, root and Chain Lightning make him a pain to deal with. You can't 1 on 1 him and he can lock you down. Tyrande: Her stun combined with her ability to make you vulnerable can absolutely ruin E.T.C., especially if you have just used Mosh Pit. Malfurion: His root is a major issue as it can prevent you from escaping and zone you out before you have an ability to Powerslide into combat. This list of tips and tricks are just a handful of things we think will help your E.T.C. play. We'll continue to add to the list as required and if you have any tips you'd like to share, let us know in the comments below and we'll place them here. 1. Don’t just Power Slide into a fight. Once it’s on cooldown, you’ve no guaranteed means of escape. 2. Power Slide can allow E.T.C to pass through Heroes, minions and mercs. Use this to stop an opposing player. 3. Ideally, try to use Power Slide so that you always appear on the opposite side of your target. That way, you can repeatedly body-block them before using Face Melt. 4. Power Slide offers a stun, so can interrupt abilities such as Blaze’s Combustion or Li Li’s Jug of 1000 Cups. 5. Face Melt’s damage is low. Its primary value is its knockback. 6. Try to knock enemies back towards your team, not away from them. You don’t want to give the opposition a helping hand in escaping. 7. Face Melt will interrupt some abilities, so use it to prevent actions (such as Kael’thas casting Pyroblast). 8. Guitar Solo is a powerful heal over time. Use it early, rather than late. It lasts 4 seconds, with only an 8 second cooldown. 9. Use Stage Dive a little away from where you think players will be. There’s a delay between casting, and landing, so you need to anticipate player movement. 10. To maintain your Trait, try to stagger your abilities so that your +20% armor boost lasts for a lengthier period of time. Thanks for reading our E.T.C build guide. You can help support its updates by subscribing to Ten Ton Hammer. Here's the details.